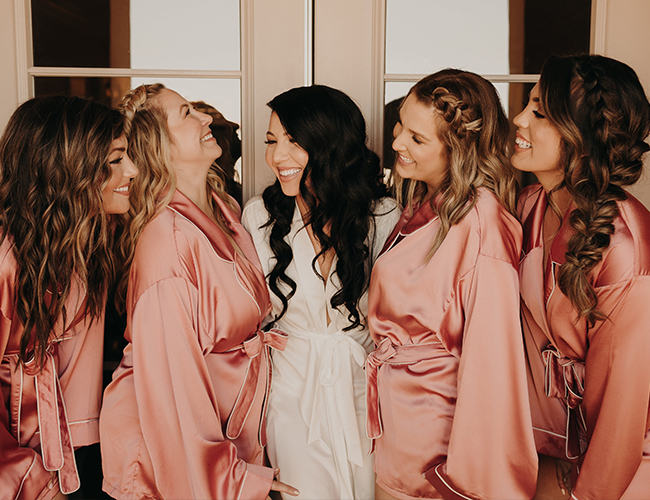 This isn’t your typical Vegas wedding – that is, not the cheesy venue, Elvis officiant, and mini dress, at least! 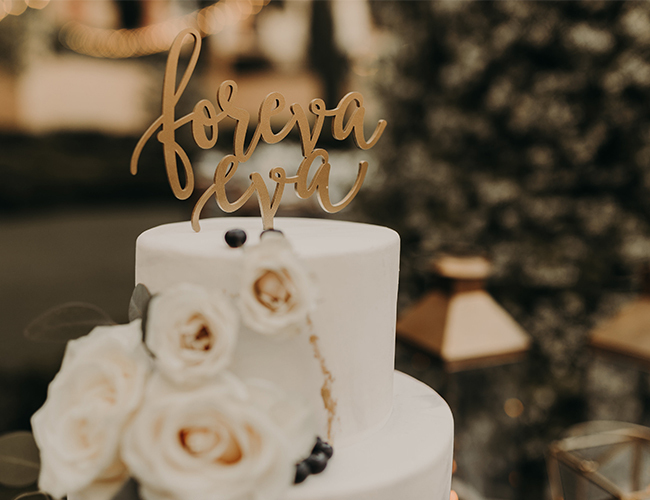 No, this modern glam white and gold wedding on our wedding blog today is a much more elegant affair! 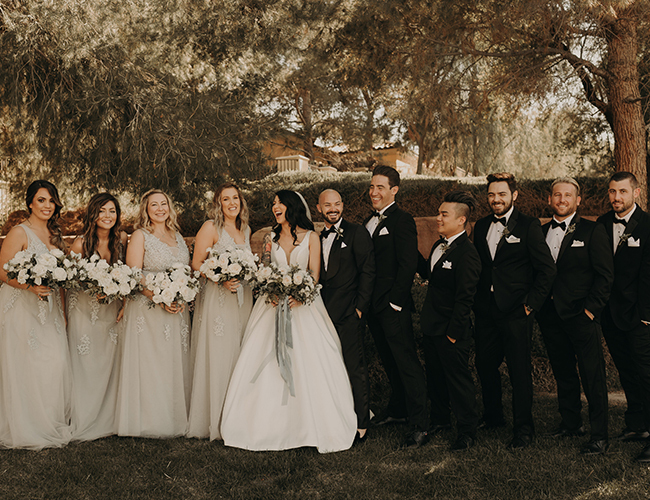 The bride and groom are not only beautiful, but made luxe fashion-forward choices with their attire that will blow you away! And their planner at I Do Details, did an equally good job of blowing us away with the decor. We’re pretty sure they walked away from the day feeling like they hit the jackpot. Their planner shares, Ashley & Brandan met with they were 16 years old. They lost touch but fate brought them together when Brandan’s friend moved into the condo above Ashley. They started running into each other all the time and the rest is history. During their relationship, Ashley lost her father and Brandan lost his mother soon after. With both of them losing their parents, it really brought them closer together and gave them a strong foundation before getting married. Brandan proposed to Ashley around Christmas time. He told Ashley he bought new dog tags for the pugs and to go double check that the information on them was correct. 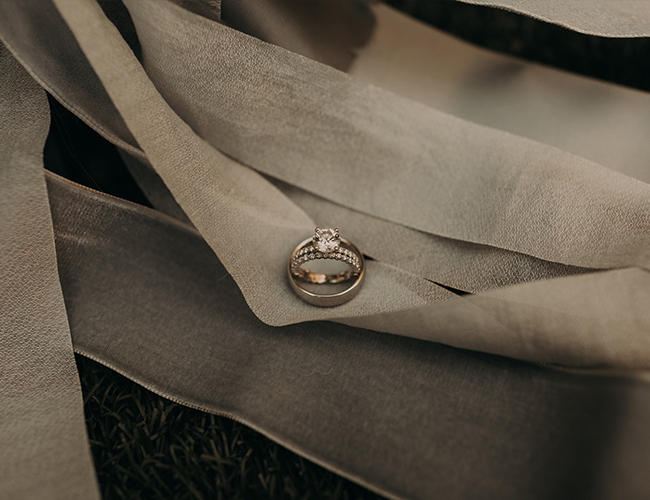 The dogs were sitting in front of the Christmas tree perfectly and Ashley went over to read the tags and one read, “Will you” and the other read, “marry me.” Ashley turned around and Brandan was on one knee with a stunning ring! 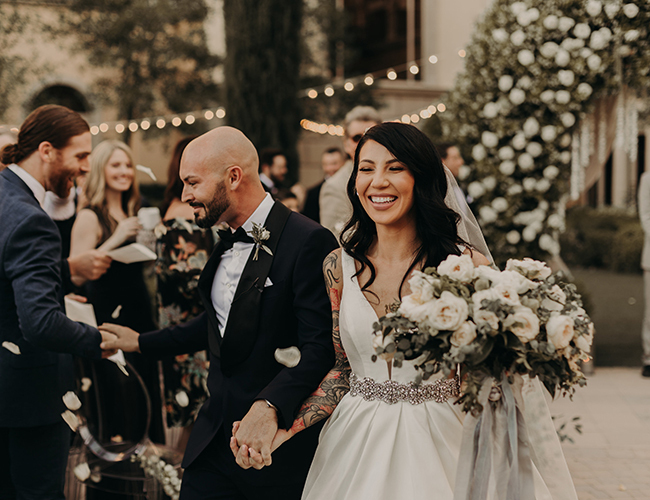 With Brandan and Ashley being Las Vegas natives, they wanted to get married in Las Vegas, but didn’t want to get married on the strip or at a cheesy venue. 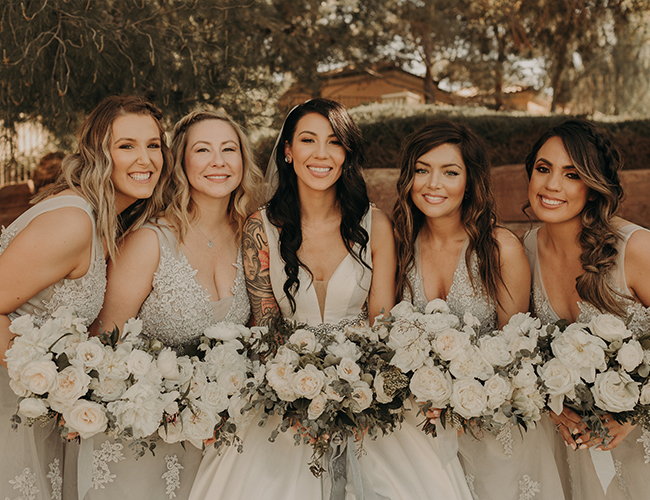 They stumbled upon Hilton Lake Las Vegas, and they felt like they were in a different city surrounded by greenery (which isn’t easy to find). 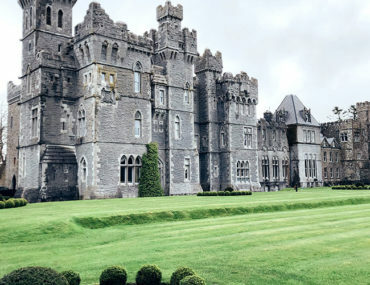 They knew this is where they wanted to get married! The Hilton Lake Las Vegas Resort offers a luxurious escape, yet with easy access, to the bright lights of Las Vegas. Italian gardens, ornate bridges, vine-covered balconies, and romantic trellises distinguish this Mediterranean-inspired resort. The couple exchanged vows in the garden under one of the natural green arches. Layers of Lovely added white floral to the arch and placed gold lanterns on each side! 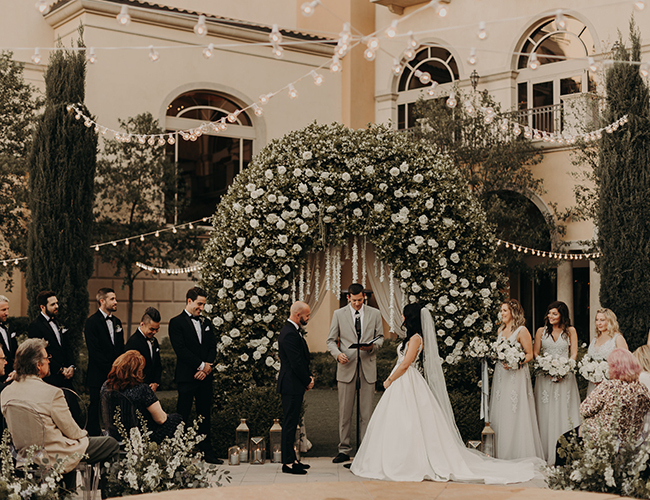 The floral archway they created was the focal point for the ceremony! Cocktail hour took place on the bridge over the lake, while the ceremony area was flipped for the reception. 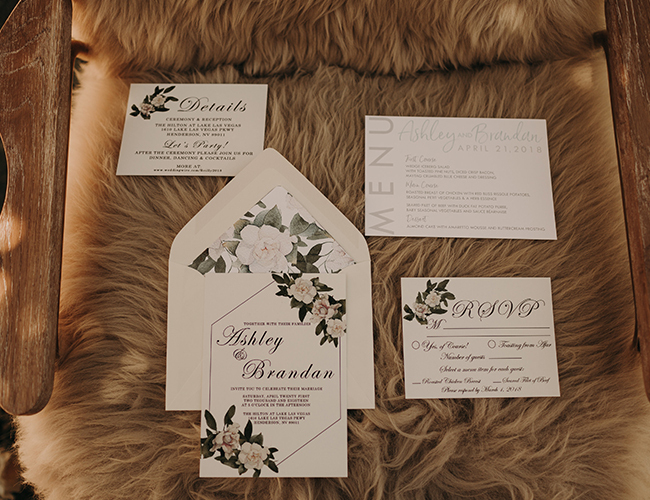 We utilized all four garden quadrants for the reception. Two being used for seating, one being used for the bar/lounge/caricature artist area, and one being used for the corn hole game set-up. A fire place is centered between all four quadrants and the dance floor was the area around the fire place. Attire was a big deal for the couple. They are both little fashionistas and they wanted their personalities to really stand out with attire. The bride chose a gorgeous sleeveless Calla Blanche gown with a deep v neckline, a beaded belt, and stunning details. The cathedral length veil complemented the gown perfectly with beading as well. The bridesmaids dresses were v neck gowns with tulle appliqué. 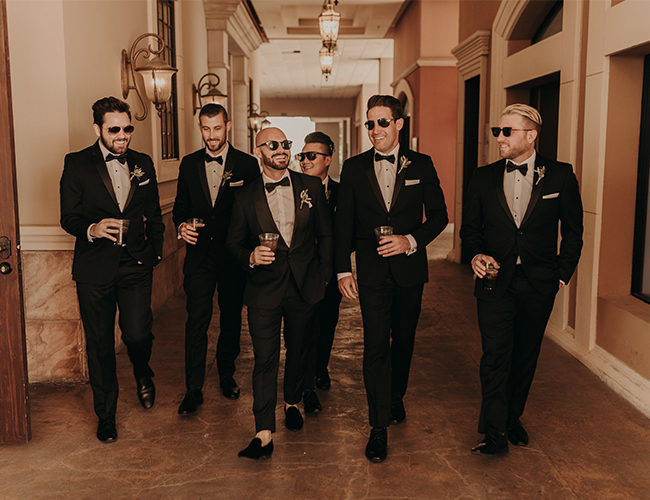 The groom was very specific with his tuxedo as well; he chose a navy Lazio tuxedo jacket paired with black tuxedo pants, black suede loafers and a black bow tie! 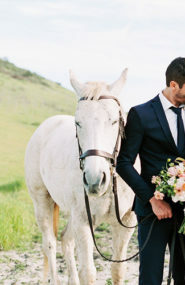 In addition to attire, the couple wanted to include rustic and modern elements. We had a mix of round tables and farmhouse tables. 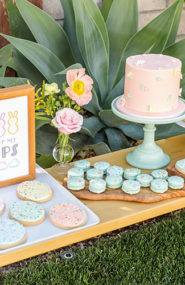 The round tables had white feather linen overlays. We kept the farmhouse tables naked to give it that rustic vibe. Ghost chairs were used for the ceremony and the reception, adding the perfect amount of modernism to the day! 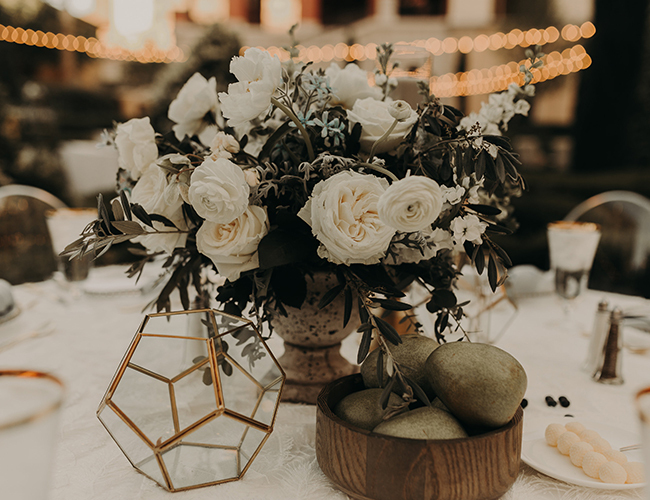 The tables had lush floral arrangements in concrete vases, pears and blueberries in wooden and concrete bowls, vintage gold flatware, gold beaded charger plates, gold geometric candle holders, gold rimmed glassware, and knotted grey napkins. Since the couple is obsessed with their dogs, we included a signature cocktail called “The Frank” named after their pug. The drink was a jack & ginger and was a HUGE hit. 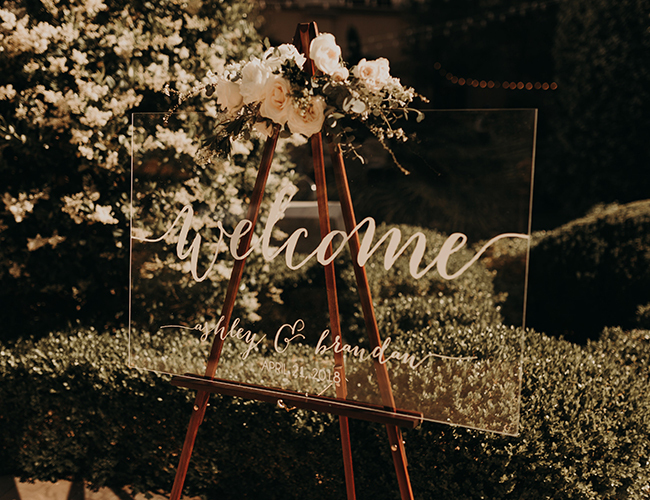 The bride has a graphic design background and she actually DIY’d the signature cocktail sign! We also had a Sip & Be Seated display for guests to find their ways to their seats. 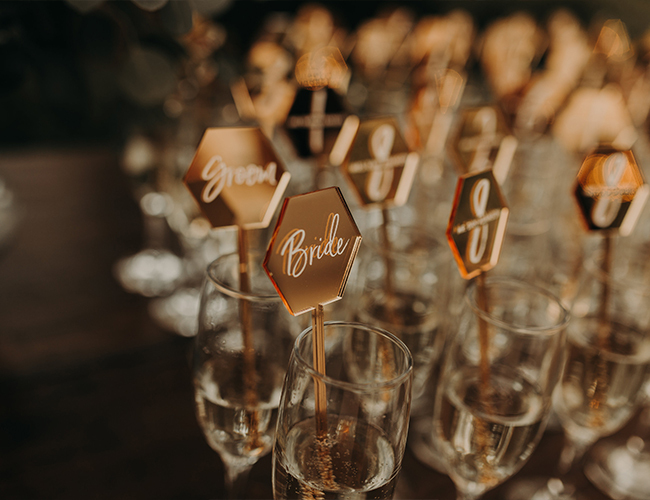 Inside a glass of champagne was a gold hexagon mirrored acrylic drink stirrer with white writing including the guests name and table number! They were gorgeous. 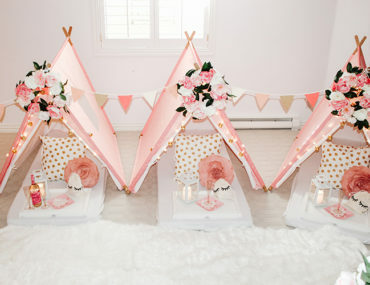 This is my dream wedding!! !